St. John Brebeuf School in Niles, Illinois recognized the fast pace at which technology is evolving and hatched a plan to become a 21st century school. The school had been saving from multiple fundraisers in order to implement a 1:1 initiative within three years. In the first year of the initiative, the school ordered 60 tablets and 60 Chromebooks for students and increased by 100 more in the second year. To align with the digital initiative, St. John Brebeuf School also has taken steps to reduce paper use as much as they can. To support this effort, the president of the Parent School Association proposed a web-based school supply list solution, TeacherLists, to the school principal. To manage the technology updates, the district created a new position to handle the initiative and educate teachers on the new digital programs. After ten years as a classroom educator, Adam Taylor was interested in the evolving technology, and was appointed to be the new assistant principal of learning and technology. Before updating to online school supply lists, St. John Brebeuf School sent home paper lists with the last report card in June. Since, as Taylor pointed out, most parents don’t shop for school supplies in June, the lists often got lost or thrown out. The school has 17 faculty members, and a student population of 285, so implementing TeacherLists was very easy. The educators uploaded their school supply lists and Taylor maintains them by adding and subtracting items each year. Taylor’s daughter just began first grade, so he and his wife were especially grateful to have TeacherLists as a resource as they shopped for school supplies. They accessed the list on their mobile devices at the store and were confident they had everything their daughter needed. At the beginning of the 2015 summer season, TeacherLists announced a sweepstakes for users to enter by simply updating or entering a school supply list and sharing the provided link through a class or school website. A couple weeks into the 2015-2016 school year, Taylor received a phone call from TeacherLists co-founder, Tim Sullivan, congratulating St. John Brebeuf School on winning the sweepstakes and $5,000 to improve their community. Taylor said that they would use the funds to enhance their Language Arts program to compliment their 1:1 initiative. 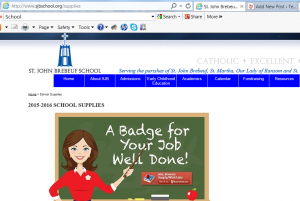 Congratulations St. John Brebeuf School!